“Race films” were made with African American actors and crews, and for the most part by African American directors and producers; they were popular with African American audiences from the 1920s to the 1940s, but are little known, now. 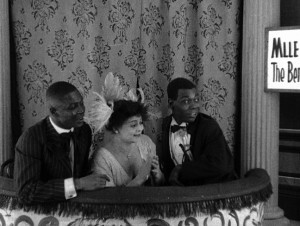 The set, which Kino Lorber is billing as “the most comprehensive collection of early African-American cinema ever assembled,” includes more than a dozen silent and sound feature films by pioneering directors, such as Richard Maurice, Spencer Williams, and perhaps most notably Oscar Micheaux, as well as rarely-seen footage shot by writer Zora Neale Hurston (see, above), and a good deal more. For comparison, the producers have included work by white directors of “race films” including Richard E. Norman and Frank Peregini. 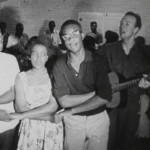 And, to illustrate what Jacqueline Najuma Stewart, a professor of cinema and media studies at the University of Chicago calls “the diversity of Black filmmaking prior to the Civil Rights Era,” the producers of the box set have included many shorts, rare fragments, trailers, documentary footage, home movies, and interviews with historians and film preservationists. 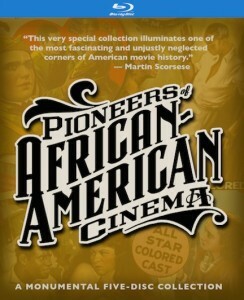 An outstanding 80-page booklet with essays and film notes accompanies the set. A trailer for the series provides a sense of the great stylistic diversity of the films, and their visual surprise. 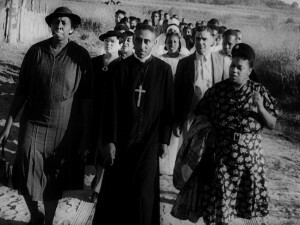 “Race films” differed from a variety that Hollywood studios made with black actors, called “black cast films.” Those were primarily targeted at white audiences, while “race films” were “exemplary American films” by makers who often were determined to “take up thorny ethical and political questions, while taking bold stylistic risks,” writes Jacqueline Najuma Stewart, a film historian at the University of Chicago, in an essay in the new set’s accompanying booklet. 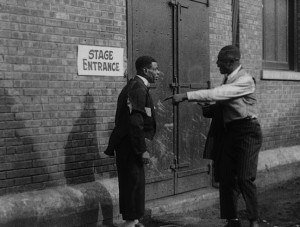 In the Ebony Film Co.’s “Two Knights of Vaudeville,” made in 1915, three friends find their way into a vaudeville performance, only to find that they are not the kind of clientele the management prefers, so they are escorted out. Vaudeville houses, and then the cinemas that evolved from them, were not spaces where black Americans could be comfortable. 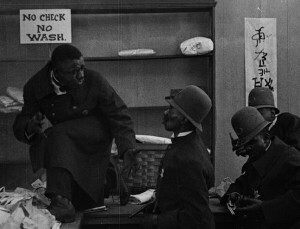 A variety of the film makers, and Oscar Micheaux most of all, engaged such demarcations of the “color line” by, for example, presenting characters who were racially ambiguous, or by recasting for black audiences plays that, while they included black actors, were intended for white audiences. In one film, writes Musser, Micheaux “probes the complex psycho-dynamics around the act of passing” – purposely appearing to be of a race that, in conventional terms, one was not. In such ways Micheaux sought “to generate conversations about the color line on each side of that divide.” Doing that, he often perturbed audiences, critics, and cultural commentators, black and white. From “Within Our Gates,” by Oscar Micheaux, 1915. Micheaux made about 21 silent films between 1919 and 1930, of which only three survive. Those are all in the Kino Lorber package and were, writes Musser, “serious melodramas that engaged the color line.” In the earliest surviving feature by a black director, Micheaux’s Within Our Gates, from 1919, Evelyn Preer, a key figure in “race films,” plays a young woman who has followed the Great Migration from the rural South to the urban North. 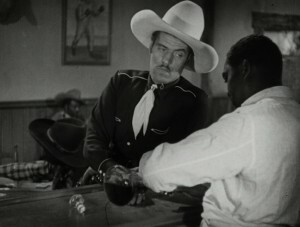 The film contains a lynching scene, which led the Chicago Board of Movie Censors for a time to bar it, for fear of rioting; then, when the ban was lifted, black activists objected to the realistic depiction. 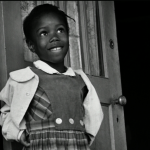 In Micheaux’s 1939 feature, Birthright, a Harvard graduate returns to the South to set up a school, but is opposed by both white and black citizens. 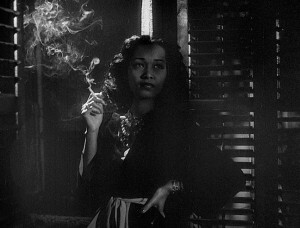 Among other films in which directors dared to offend “the more respectable class of African-American theatergoers,” Musser writes, was Dirty Gertie from Harlem U.S.A., Spencer Williams’s 1946 retelling of W. Somerset Maugham’s short story “Miss Sadie Thompson,” which had been the basis of Rain, a 1932 film starring Joan Crawford. 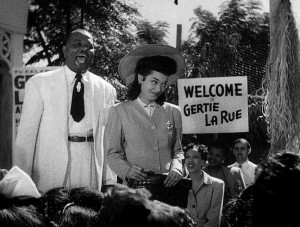 Gertie la Rue is a nightclub singer (played by Fancine Everett, left and below left) who goes to a Caribbean island that black people both populate and run to entertain American troops and to try to elude an embittered lover. There, a self-righteous missionary tries to drive her away. The film “embraces a distinct form of black sociability and savors transgressive black behavior,” writes Musser. Micheaux’s “black spaces” were never self-contained, and instead always were constructed to make points about race constructions and relations, he notes. A word about musical accompaniment. Executive producer Paul D. Miller, who as a musician and cultural commentator goes by the moniker DJ Spooky, created a new musical score for two of the restorations that are in the Kino Lorber set, and commissioned new musical accompaniment for other restorations from other composers working in various jazz, classical, hip-hop, and techno-music settings. Miller says that “all the while a deep respect was maintained for the historical materials,” and doubtless it was. 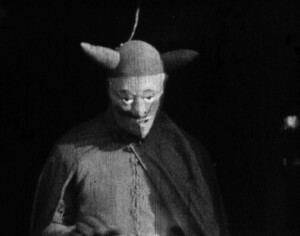 But the results often underscore how complicated the task is, whether historic silent films are to be viewed on large or small screens. 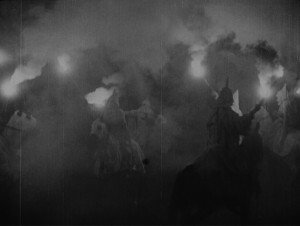 Some of the new scores are effective, such as the now-late Max Roach’s drummed accompaniment to Oscar Micheaux’s The Symbol of the Unconquered: A Story of the KKK, from 1920 (image, left). But in the case of some other films, the accompaniment seems to ramble along, or stumble. That cannot, however, spoil the pleasures and value of this extraordinary film package. Two Knights of Vaudeville Ebony Film Co., 1915. 11 minutes. Music: Donald Sosin (left). 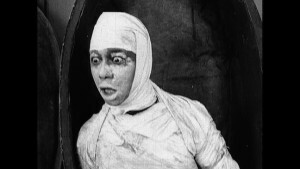 Mercy the Mummy Mumbled (Blu-ray only) Ebony Film Co., 1918. 12 minutes. Music: the Alloy Orchestra (right). A Reckless Rover Ebony Film Co., 1918. 14 minutes. Music: Donald Sosin. 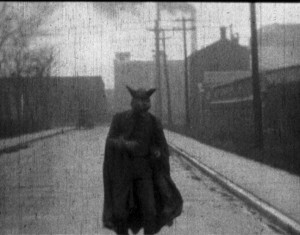 Within Our Gates Oscar Micheaux, 1920. 73 minutes. Music: Paul D. Miller, aka DJ Spooky. T he Symbol of the Unconquered: A Story of the KKK Oscar Micheaux, 1920. 59 min. Music: Max Roach. By Right of Birth Lincoln Motion Picture Co., 1921. 4 minutes. Music: Donald Sosin (left). Body and Soul Oscar Micheaux, 1925. 93 min. Music: Paul D. Miller, aka DJ Spooky. Regeneration Richard E. Norman, 1923. 11 min. Music: Donald Sosin. 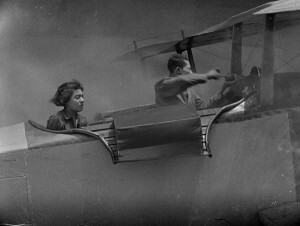 The Flying Ace Richard E. Norman, 1928. 65 min. Music: Mont Alto Motion Picture Orchestra (left). Ten Nights in a Bar Room CPFC, 1926. 64 min. Music: Donald Sosin. Rev. 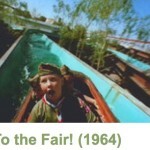 S.S. Jones Home Movies Rev. Solomon Sir Jones, 1924-1926. 16 min. Music: Andrew Simpson. Eleven P.M. Richard Maurice, 1928. 60 min. Music: Rob Gal. Hell-Bound Train James and Eloyce Gist, 1930. 50 min. Restored by S. Torriano Berry. 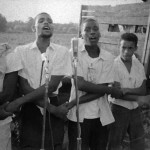 Music: Samuel D. Waymon (left & below). Verdict Not Guilty James and Eloyce Gist, 1934. 8 min. Restored by S. Torriano Berry. Music: Samuel D. Waymon. Heaven-Bound Travelers (Blu-ray only) James and Eloyce Gist, 1935. 15 min. Restored by S. Torriano Berry. 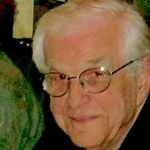 Music: Samuel D. Waymon. The Darktown Revue Oscar Micheaux, 1931. 18 min. The Exile Oscar Micheaux, 1931. 78 min. Hot Biskits Spencer Williams, 1931. 10 min. The Girl from Chicago Oscar Micheaux, 1932. 70 min. Ten Minutes to Live Oscar Micheaux, 1932. 58 min. (right). Veiled Aristocrats Oscar Micheaux, 1932. 48 min. Birthright Oscar Micheaux, 1938. 73 min. The Bronze Buckaroo Richard Kahn, 1939. 58 min. (right). 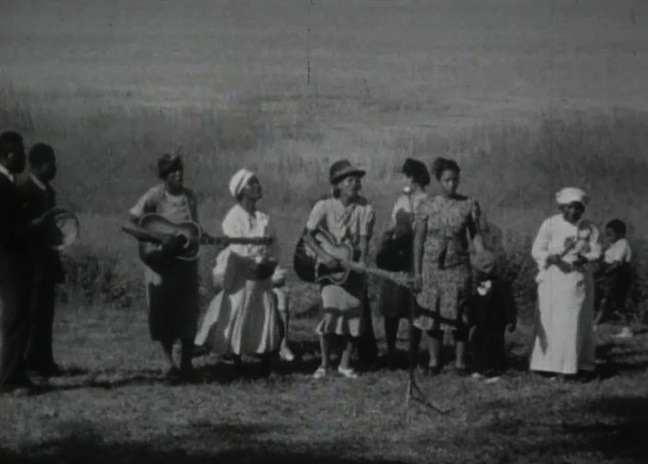 Zora Neale Hurston Fieldwork Footage (excerpt) Zora Neale Hurston, 1928. 3 min. Commandment Keeper Church, Beaufort South Carolina, May 1940 (excerpt) Zora Neale Hurston, 1940. 15 min. The Blood of Jesus Spencer Williams, 1941. 56 min. (left). Dirty Gertie from Harlem U.S.A. Spencer Williams, 1946. 60 min. Moses Sisters Interview Pearl Bowser, 1978. 32 min.